After a much needed floor replacement, the RE was taken to have its yearly MOT which it passed. 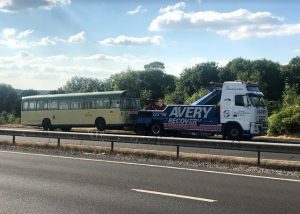 It was then prepared for a trip to Alton Bus Rally on the 15th of July but unfortunately didn’t make it as the fuel lift pump failed. All members on board were recovered safely and made it to the show however, HHW920L got recovered back to base where a new pump was fitted. Upon close inspection of KHU323P’s chassis, it was clear that there was some work needed to the Near side chassis member. After some searching, a company was found that would produce a new chassis member for what was needed. The new piece of chassis has been fitted and welded into place, the whole chassis has received a fresh coat of paint and is looking very smart. Next on the list is to remove the rear springs for a new set to be made and fitted. A MOT has been booked! The new floor & flooring have all been fitted, all seat frames painted. L503 VHU Gets a re-trim. 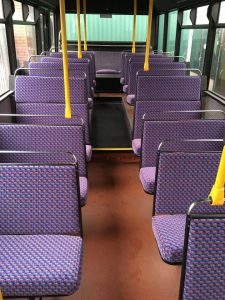 L503 VHU receives a re-trim to replace the old tired Moquette with new ‘Eye’s Down’ Moquette.